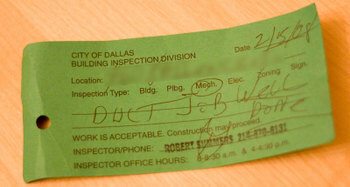 Well, we had our mechanical (HVAC) inspection today and passed with flying colors. I wasn't there, but our GC (aka "my wife") said that the inspector was very nice and extremely complimentary about the quality of the work he saw--not just with the HVAC--but also with the plumbing and electrical. Trust me -- that's exactly what you want to hear from your inspector! Anyway, sounds like it was a love fest all around and everyone left smiling. The whole green tag thing seems very old fashioned. I wonder if they gave out green tags in 1957 when the house was built? !